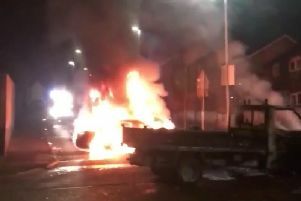 Firefighters came under attack from a group of youths in Downpatrick as they attended the scene of an arson attack, police have said. A number of wheelie bins were placed across the road and set alight by the group on Tuesday night. Missiles were thrown at firefighters when they arrived at the scene in the Killough Road area to extinguish the fire. Police officers remained at the scene to monitor the situation throughout the night, the PSNI said. There were no reports of any damage. PSNI Inspector Darren Hardy warned any damage to emergency vehicles could endanger lives. He said those involved in throwing missiles at emergency vehicles need to be aware of the dangers their actions can cause. “Any damage caused that results in a vehicle being removed from service for repair will diminish the capability of the emergency services to respond to calls. Mr Hardy said police are aware of ongoing concerns regarding criminal damage and vandalism in the area and said they will do their “utmost to detect and deter this type of activity”. He called on parents to be aware of where their children are gathering, as many are coming from other neighbourhoods and becoming involved in anti-social behaviour. Anti-social behaviour can be reported to police on the non-emergency number 101.